The Milky White lube is formulated to outperform petroleum products and has been race tested in both mountain bike and road bike competitions. Yelo Velo, a Reno/Tahoe based bike lube company, is introducing the first high performance plant-based lubricants. Their Milky White lube contains three different types of plant oils plus ceramic powder. 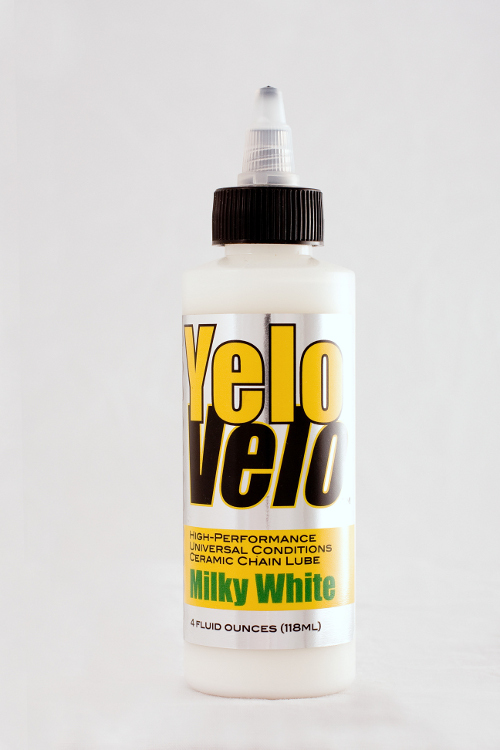 Results from two years of testing product show Yelo Velo's Milky White outperforms petroleum lubricants. “We understand bike enthusiasts care about performance, performance and performance. Our products are designed to meet or exceed the discriminating cyclist's demands. The fact that our lubes are also plant-based is an added bonus,” according to company president Mark Lowenstern. “What separates Yelo Velo from other plant lubes is our engineered patent pending formula using multiple plant oils, providing the perfect mixture.” Yelo Velo lubes provide multiple performance attributes including anti-corrosion, anti-oxidation, durability, adhesion to metal, reduced friction, no oily build-up, easy cleaning and a quiet drive-train. Yelo Velo's complete line of biodegradable 100% plant-based lubricants and cleaners are grown and manufactured in the USA, including the recycled bottles. For more information, go to http://www.yelovelo.com.